Cupcakes 'n Daisies: Summer of Fun Recap.. . So, on June 20th I blogged about my idea of a stress free summer of sewing, set a few goals, named it "The Summer of Fun", and topped things off with a yoyo guessing contest. Since summer is officially over at my house I thought I would do a little Summer of Fun recap post. *Hexies - I didn't make a single flower, didn't even get one piece out of the neat little travel bag that I organized to make making Hexies easier. *Memories of Province - I didn't touch this project box all summer, but now that Northern Lights is done this is my next BOM Rehab project. So that's it as far as goals that didn't get any attention at all, not so bad! Here are the goals that I set and made some progress with, in some cases, very little progress! *Farmers Wife - I'm sticking with my earlier decision to make a wall hanging, not a full size quilt, and I did get out the book and select a stack of blocks that I thought I could easily shrink down to 4 inches, so I'm ready to make some blocks, but didn't manage to make any this summer. *Minick and Simpson, my goal was to make something using my my Minick & Simpson stash, my attempt at making Free Spirit Medley using that fabric was my biggest disappointment of the summer. It wasn't fun, and did not look at all like I thought it would. But I learned a few things, mainly that the busy Free Spirit Medely pattern needed simpler fabric with a smaller print. I'm thinking I may give this pattern another go using Old Glory Gatherings by Primitive Gatherings for Moda. I also learned that just because a fabric is in a fat quarter bundle, you don't have to use it! This isn't the end of the story for that pattern or that fabric. *Tools Drawer - My goal was to clean out my drawer (check) and to figure out how to use the tools in that drawer that I didn't understand how to use or had never used. I think I have 4 tools left that I need to research and determine their fate as a keeper or a loser. *YoYos - my goal was to make as many as I could, I made 27! 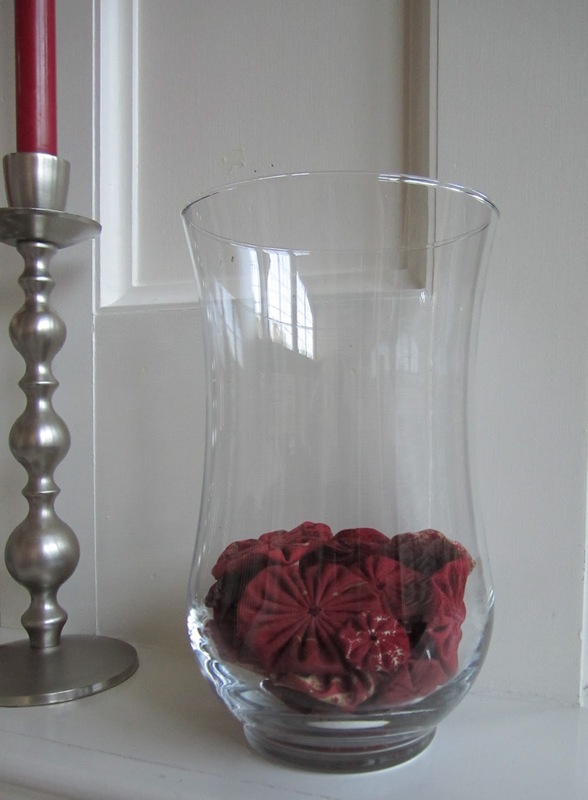 That definitely wasn't as many as I could make, I intend to make more and fill that vase, sometime! Amy guessed 128 and wins the contest, even though she was off by more than 100, but that was soooooo much closer than so many of you! Amy drop me an email so we can discuss your layer cake choice at cupcakesndaisies@gmail.com. Here are the goals that I set and accomplished! *I made my sewing machine cover! 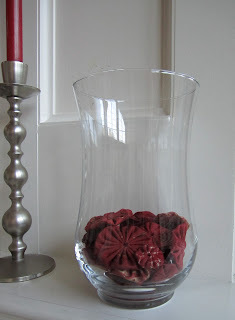 *I made Spools and to add to the fun some of you made one too! *I finished Northern Lights, meeting this goal, after sitting on on those BOM packages for years made me very happy. * I made my summer Schnibbles; Leap Year for June, Hubbel/Hubble for July, and Dimestore for August. * I learned to work with wool! * I met Paula Barnes from Bonnie Blue Quilts! * I visited the Temecula Quilt Company! * Had a grand old time at the Buggy Barn! And that my friends is how I spent my Summer! Whew, I think I'm done setting goals for this year, whatever I do, that's what I get done. But it sure was a summer of fun for me, thanks for following along! And after reading your comments from last week, I'm happy you had a summer of fun too. thats alot i think i never get alot done in summer i work in a resteraunt and we are very busy in summer winter is my time although i think you get me to to more whaen i see what you have almost have my bounce finished i did not enjoy sewing all those little strips together i can never get small strips or small triangles to come out atraight somehow do you have a secret for this please share !!! Yes...for sure do it again next year and made us do it too! You got a ton of things accomplished! The yoyo contest makes me giggle...we were so off on our calculations! What pattern is shown with the Minick & Simpson prints? Really love how it's coming together. 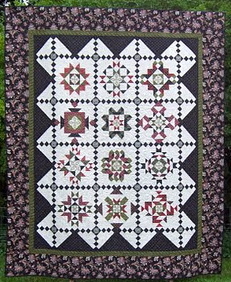 That pattern is Free Spirit Medley by Judy Martin from her Knockout Blocks and Sampler Quilts book. I also set a goal to make as many yo yo's as I could along with some other goals. But the yo yo' I am up to 280ish, might be 178 but that is a pretty close guess. I bought a really big jar with a lid to keep the dust off, I figured by the time I get them done and use them they would get dusty. Thanks for the motivation. I did meet almost all of my other goals too, several fall projects all ready to do and I have started a couple for Christmas. Robin, sorry I always post as anonymous only because I am in a rush. I work at a school, and I imagine nearly everyone is writing a composition today, "What I Did This Summer." Old habits die hard, eh, Thelma? I have always believed Labor Day to be the REAL New Year's Day and tend to look ahead and set goals. Looking BACK is a splendid idea. Vis-a-vis Farmer's Wife shrinking to 4", many of her blocks can also be found in "Around The Block" and the 4" size is there. I'm working on a SIMILAR to Farmer's Wife quilt (Farmer's Girlfriend, perhaps) and am using only non-template blocks that I get from Around The Block. 6" here. Didn't mean to run on and on and ON . . . . . I think it was fun following along on your Summer of Fun! And you accomplished so much...I've been trying to focus more on what I have accomplished instead of worrying about the goals that didn't get "checked off." I'd say you had a very successful summer of projects. Lots accomplished. Sound like an awesome summer! You have accomplished quite a lot and should be so happy about that. I have enjoyed your journey with you. I would LOVE to learns to work with wool - could you let me know if you took a class or learned from a book that you could recommend. For some reason, wool is The Great Unknown (scary!). Thanks. Check Shakerwood Woolens website and ask Cathi what she recommends.....very talented wool head who spends hours dyeing her own! Wow, I can't believe how much you actually got done! Oh, and I was one of the "high numbers for yoyos"...I so thought you were going to make a gazillion of them :) Same time next year for sure! It looks like you did have a very fun and memorable summer Thelma! I was just wondering how your Yoyo's were coming along! I am getting ready to post my somewhat summer of fun... and yes, I think it would be great to give it a go again next year! Thanks for the inspiration! You got a lot done for a summer of fun. This year was my summer of work (you know, that kind of work you've retired from); I want more time for fun next summer! Of course you should do it again next year, Thelma! It was such a fun way to greet the summer and then segue into fall. You certainly got more accomplished than I did! So glad we both got our sewing machine covers made.